Geoff Hunt - Portrait of a Marine Artist is a riveting piece of documentary making for anyone interested in art, the age of fighting sail, or the Napoleonic Wars. It is simply done, almost too simply, but with face-in-camera Geoff Hunt explains how it is he has managed to move from young illustrator through to being one of the pre-eminent marine fine artists in the world. Hunt is very self-effacing and while you see immense pride in his work, you never get the feeling he has a superiority complex. All that matters to him, it seems, is getting it right on either canvas or board. Mind you, while his ego is contained, his desire for accuracy doesn't seem to have any bounds as he pores over captain's diaries, journals and weather charts to get everything correct on his historically exact works of art. As if getting the miles of rigging ropes isn't enough, Hunt has to make sure his painting of Trafalgar has the right angle of light, for the right moment. Unbelievable. Now if you don't know of Geoff Hunt - he is the artist who produced the cover art for the very successful Patrick O'Brian novels covering the exploits of Jack Aubrey and Stephen Maturin. He is also the president of the Royal Society of Marine Artists. Geoff Hunt - Portrait of a Marine Artist explores Hunt's career, his passion for maritime art and mixes it in with an unexpected dose of humility from the artist. This is no ego-centric artiste, this is a fantastic painter who freely admits to getting seasick looking at a glass of sea water. It is this very ordinary side that makes this documentary so appealing as Hunt plays down his success despite his obvious abilities with the brush. And you get to see the master in action as he works on a new painting. Not only does he have the work in his mind's eye, Hunt has the technical ability to bring it all to life. 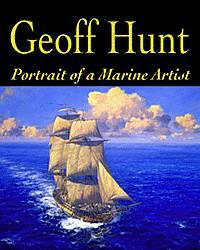 We can recommend Geoff Hunt - Portrait of a Marine Artist as a very watcheable and interesting glimpse into the man's career and way of working.